iCloud Photos, formerly known as iCloud Photo Library, is an Apple service that moves the user's entire photo and video library into the cloud. It's part of Apple's push to make it as easy as possible for users to switch among Mac and iOS devices throughout the day, making sure the user's photos are available on all of their devices and ensuring any changes get quickly synced across devices. - iOS: Open the Settings app and head to account section and tap on your iCloud account. In the "Apps Using iCloud" section, tap on Photos and you'll find a toggle for iCloud Photos. This option can also be accessed through the Photos app section of Settings. - macOS: Open System Preferences and head to the iCloud pane. If you're logged in, you'll see a list of the various iCloud services. Hit the "Options..." button next to Photos, and you'll see a window where you can turn on iCloud Photos. You can also manage settings within the Preferences section of the new Photos app directly. - Apple TV: On a fourth-generation Apple TV or Apple TV 4K, head to the Accounts section of Settings, then choose iCloud and turn on the iCloud Photos option. - iCloud.com: Photos stored in iCloud Photo Library are also accessible through Apple's web-based iCloud.com service. Through the web interface, users can upload or download photos, browse via Moments and Albums view, print or email photos, and mark individual photos as favorites. The Photos apps for Mac and iOS are built to work with iCloud Photos, although users can opt to use local photo libraries on their devices if they prefer. Users opting for iCloud Photos have the choice of storing the original photos on their Mac or iOS device, which is ideal for offline access, or a more flexible optimized arrangement that stores originals locally if you have enough storage space but uses lower-resolution versions if local storage is tight and only downloads the full-resolution versions from iCloud as needed. Similar settings are available on iOS, where users can choose between storing full-resolution photos right on their devices or saving some space by storing lower-resolution versions onboard and keeping the full-resolution versions in iCloud. On iOS and macOS, users may also continue to see an option for My Photo Stream, which is Apple's separate service that allows users to automatically sync their last 30 days' worth of photos (up to 1,000 photos) between devices. Users who recently created their Apple IDs may not see the My Photo Stream option, as Apple is phasing out the feature. On devices where iCloud Photos is active, there will no longer be a separate My Photo Stream album as there was prior to the rollout of iCloud Photos, as all photos are now included in the main library stored in iCloud. My Photo Stream doesn't count against your iCloud storage limits, but edits made to photos in My Photo Stream don't update across your devices. The My Photo Stream setting does, however, offer some level of integration between devices where iCloud Photo Library is enabled and those where it is disabled. Turning on My Photo Stream on a device with iCloud Photo Library is enabled allows the device to import Photo Stream photos from other non-iCloud devices and also send new photos out to My Photo Stream for display on those devices. Once you understand that iCloud Photos stores and syncs photos across devices, usage is very straightforward and it behaves very much like a local photo library stored on the user's machine. Users can freely manage, edit, and save their photos as they have always done, with the added bonus of that work automatically appearing wherever they have iCloud Photos enabled. The original photos always remain stored in iCloud, making it easy to revert any edits made on a device. As with a local photo library, users can include photos from any source, making iCloud Photos more than the alternative Photo Streams of images taken on their devices. Photos and videos of a wide range of types from any source can be added to the user's library on one device, and they will sync to all other devices. One important consideration when deciding whether or not to use iCloud Photos is that it is an all-or-none proposition on a given device unless the user chooses to use multiple photo libraries on macOS. With a single photo library, there is no option to sync only some photos while the remainder is stored only locally. For example, users can not opt to have only their iOS device photos synced to their Mac via iCloud Photos but not have their full library of photos in the Photos app for Mac synced to iCloud and the user's other devices unless they want to manage multiple libraries. 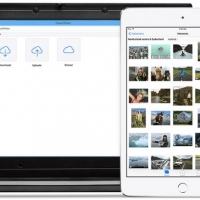 Photos are stored in iCloud Photos at their full resolutions and in their original formats. Common formats like HEIF, JPEG, RAW, PNG, GIF, TIFF, HEVC, and MP4 are all supported, as are special formats captured on iOS devices like slo-mo, time-lapse, and Live Photos. iCloud Photos taps into a user's iCloud account storage, which is also used for iCloud Drive document storage, device backups, and more. iCloud users receive 5 GB of storage for free, but users who wish to back up their devices to iCloud frequently find they need more than that, and iCloud Photo Library will only increase the need for additional storage. Apple offers several paid storage tiers for iCloud, priced on a monthly basis and ranging from 50 GB to 2 TB. The lowest paid plan at 50 GB costs $0.99/month in the U.S., with Apple also offering a 200 GB plan for $2.99/month and a 2 TB plan for $9.99/month. Even the high-end 2 TB plan may not be enough for some users who have a lot of photos, requiring them to either archive some photos outside of the service or simply opt to not use iCloud Photos at all. 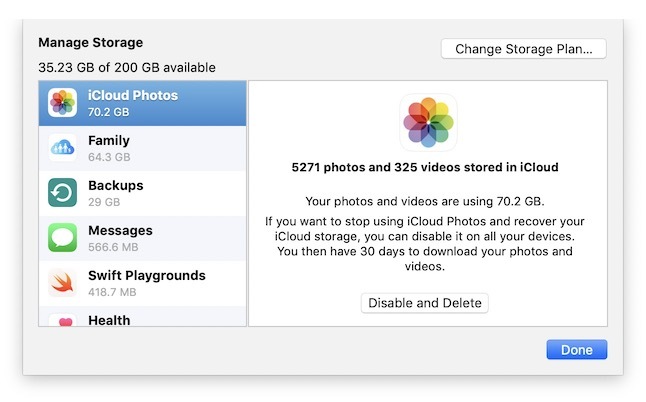 If you fill up your iCloud storage allotment, new photos and videos will no longer be uploaded to iCloud, and libraries will no longer be synced across devices. In order to restore iCloud Photos functionality, users will need to either upgrade to a larger storage plan or reduce storage usage by manually deleting certain photos or other files from iCloud. So what if you've turned on iCloud Photos and later decide you don't want to use it anymore, either for a specific device or across all devices? On a specific device, iCloud Photos can be disabled the same way it was turned on, through the iCloud portion of the Settings app on iOS device or System Preferences or Photos preferences on a Mac. If you are currently storing optimized versions of your photos, your system will give you the opportunity to download the full-resolution photos from iCloud, at which point you will have a complete local photo library on your device. If you prefer to turn off iCloud Photos entirely, you can head to the Manage Storage section of iCloud settings either in the Settings app on an iOS device or System Preferences on a Mac. In that section, you can choose to Disable and Delete iCloud Photo Library, after which point you will have 30 days to download your library to at least one device before it is removed entirely. 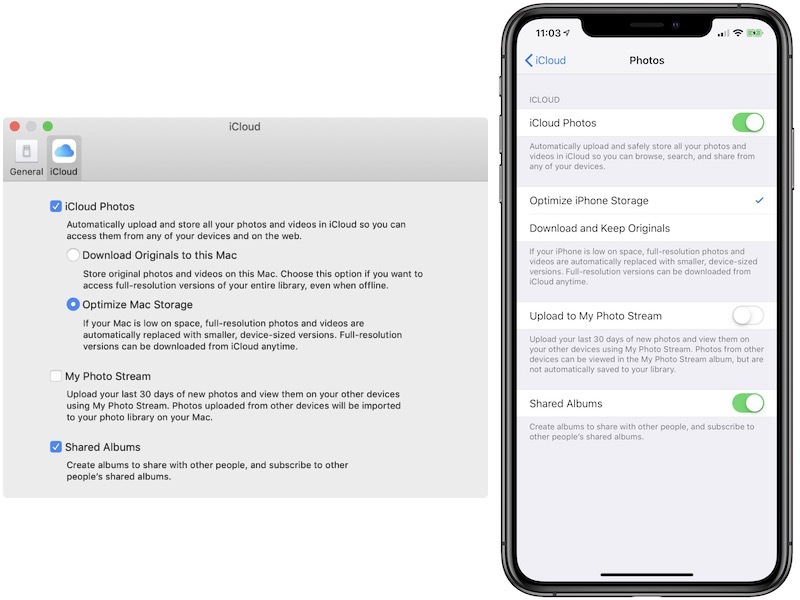 iCloud Photos represents one of Apple's key efforts to streamline the experience of using multiple devices, many of which have been bundled under the "Continuity" umbrella. Many of these Continuity features tap into iCloud as a method for linking various devices, and iCloud Photos takes that one step further to ensure the users' photos are available regardless of which device they are currently on.